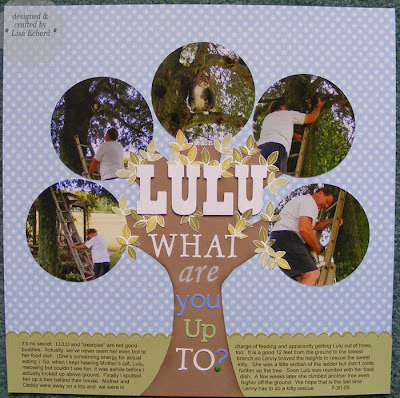 Lisa E Design Blog: Lulu, What are you UP to? A couple of years ago, my parents had this little - and I emphasize little - gray tabby stray that claimed a shrub on their property. After we lost our beloved Casey just a few weeks later, we tried to adopt the kitty. Lenny carried it to our house a half mile through the woods. He fed it, named her Lulu; she hung around the back yard for the evening. The next morning she was gone. I called my Dad and asked if he had seen the little cat. "It's not here; Lenny took it home." I told him to check the kitty's favorite hiding place - her shrub. He calls back 5 minutes later, "It's over here. What am I supposed to do with it?" "I guess you are going to keep her. Clearly Lulu wants to live with you." Fast forward a year and Lulu has grown very happy in her adopted home - grown being a key word. She no longer lives under a shrub; she has an abundance of cat beds in every conceivable sheltered spot my Mother could think of to provide for her. She's very sweet and obviously, Mother dotes on her. When my parents went on a trip, we were in charge of feeding. Apparently we were in charge of getting her out of trees, too. The tree is hand cut which isn't my best thing, but was the easiest way to get a tree the right size and position for the photos. I cut the photos first and then laid them on the brown cardstock lightly marking the branches and trunk of the tree. Distressing the edges with Soft Suede ink created a more natural looking tree and hid some of my less than terrific cutting. 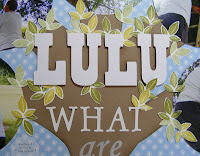 LULU is cut with the Cricut and adhered with dimensionals. The leaves create some unity between the circles and variety of letters. A scallop border emulates grass in this highly stylized version of the backyard. I did a second layer of scallops from an Old Olive designer paper. Using a designer paper with a simple overall pattern for the background adds interest without being too busy. So will Lulu climb any more trees? Let's hope not. That extension laddder got pretty wobbly! Ingredients: Stamps: Season of Frienship by SU! DSP: Delicate Dots by SU! My mother always had cats. She never sought out any of them; they always found and adopted her. Lulu sounds wonderful! And your page is fabulous.. so creative. What a wonderful design!